The first episode of a podcast series about the socio-political climate faced by Syrians and their host communities through their own eyes as the pressure rises for refugees to return to Syria. Since September 2018 Brush&Bow has been working with communities in the region of Akkar and beyond, to produce podcasts on stories of life and displacement amongst the Syrian, Lebanese and Palestinian communities there. Each podcast presents a subjective opinion of individuals whose communities have been directly effected by the war in Syria and the displacement of Syrians to Lebanon. 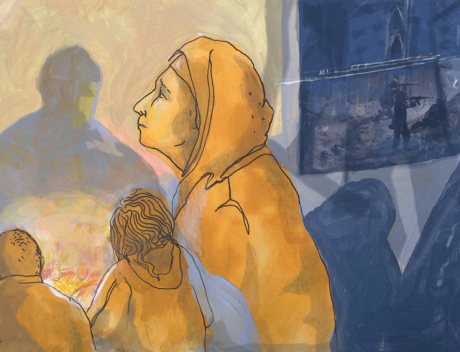 The series provides a mosaic of differing experiences and perspectives of the reasons that people fled from Syria, of the living conditions in Lebanon and of the hopes and fears about what the future might hold. All recordings are taken, translated and edited with the help from members of the local community. Interviews and Editing by Roshan De Stone & David L. Suber. Editing and Translations by Fadi Haddad. This is the first podcast of the 8-part series. It is an interview with Um Saleh, a woman who fled the city of Deir Ezzor with her family in 2013. Sitting on the banks of the Euphrates and located in the oil-rich desert bordering Iraq, Deir Ezzor is the largest city in north-east Syria, and has been of strategic importance to all contenders throughout the Syrian civil war. Initially held as a bastion of regime forces for the first years of the war, opposition forces took most of the city and province of Deir Ezzor in 2013. During the next two years, Daesh (ISIS) quickly came to dominate opposition held territory, putting pro-regime areas under a crippling siege. The presence of Daesh turned Deir Ezzor and its surrounding region into a target of heavy air-strikes from the international coalition fighting Daesh. The civilians that remained in Daesh-held territory faced a double fire: living under daily bombardment, whilst under the rule of a fundamentalist version of Sharia Law. Daesh militants needed civilians to live amongst so as to limit the intensification of air-strikes from the international coalition, whilst seeking popular legitimacy in the creation of the new Caliphate. Nonetheless, thousands of people attempted to flee the city. For those who managed to escape, the risks were high, with few places where to seek for safety. Whilst going to Turkey or to Kurdish-held territories would have been the closest option for civilians in Deir Ezzor, the Turkish border remained shut to those who could not afford being smuggled in, whilst the Kurds often also denied free passage, fearing the presence of terrorists amongst the Arab refugees who had lived in Daesh-controlled areas. For many families there was no other option but to attempt to flee to other areas inside Syria, or to further bordering Arab countries such as Iraq, Jordan or Lebanon. The story of Um Saleh, collected in November 2017 in a refugee camp in Lebanon's Bekka Valley, is the perspective of an average Syrian family from the outskirts of Deir Ezzor, who regrets the 2011 uprisings as having allowed such an escalation of violence and destruction in Syria. Her experience represents only a fragment of the very complex puzzle of memories and positions Syrian civilians hold on the uprisings and the war that is tearing apart Syria, and should therefore be heard in relation to the contents expressed in the next forthcoming podcasts. *Please note that all names have been changed to protect the anonymity of participants who, despite living in Lebanon, still fear for their lives. The views and opinions published on these podcasts are the participants alone and do not reflect the opinions of Brush&Bow. Welcome to Radio HAKAYA – حكايا the official podcast series of Brush and Bow. These podcasts report on stories and challenges of the Syrian, Lebanese and Palestinian communities in Lebanon. By focusing on individual stories, we hope to convey the complex realities of life here in Lebanon: people’s memories, present experiences and hopes for the future. We would like to remind you that the views published on these podcasts are the participants alone and do not reflect the opinions of Brush and Bow. Today’s podcast is an interview with Um Saleh, a Syrian woman from Deir Ezzor. Deir Ezzor is the largest city in Eastern Syria. Sitting on the shores of the Euphrates, close to the Iraqi border, it is a region known to be rich in oil. Um Saleh witnessed her city falling under the rule of ISIS in 2014, before attempting to flee to Kurdish held areas. Turned away on multiple occasions, she had no other choice but to flee with her family to Lebanon. In this interview, Um Saleh gives testimony to life under the self-proclaimed Islamic State, to the dangers of escaping their rule, and to the impossibility of return to her home. Interviewer: how was it in Der Al Zor? Um Saleh: Life was simple, nice…secure. We had schools and access to a good education. Every morning students attended their schools and people went to their jobs. Everything was available, I owned a nice house with a garden where I planted flowers and vegetables. We didn’t even need to have water tanks or barrels, like in Lebanon, since water was available straight from the taps. We had hot water, cold water, and water heaters, everything was available. The opposite of the life we live now. We could never have imagined what we live now, even in our worst nightmares. Um Saleh: The oil is definitely what gave Deir Ezzor its importance. Der Al Zor is the richest Syrian city in terms of oil as it has many wells. This was the reason the city was besieged by ISIS. When ISIS seized the city of Der Al Zor, they took control of all the oil wells, I lived and witnessed all of it. ISIS besieged the city as the city was held by regime forces. Many civilians ran out of food – no sugar, no bread – the city was choked by ISIS. A bag of sugar was worth so much it could be traded for a car. Military planes used to deliver food provisions to be distributed, first to the besieged soldiers, then to civilians. The soldiers would distribute provisions only once in a while. These food provisions consisted of a parcel containing 2 kilos of potatoes and a tomato paste jar, in order to get the parcel, you needed to stand in line or maybe sleep in the street for 2 to 3 days as priority was given to the soldiers and for the civilians it didn’t really matter whether we got the parcel or not. Back then 1 cucumber was sold at 1500 Syrian Liras. People became more like skeletons... If you wanted to flee you’d get killed! Um Saleh: There were 4 major players in Deir Al Zor; the regime, the Iranian militias, the Kurds (Democratic Syria Forces), and ISIS, none can deny that fact. ISIS once cracked into the Kurdish camp taking about 125 Syrian families as hostages. ISIS are not all foreigners. The majority are locals recruited via money; They target young males around 14-15 years old, from the uneducated population which form the majority of the people, especially among the Bedouins living in the desert who have spent their life raising sheep and never attended any school. ISIS could control them easily, giving about 50.000 - 60.000 Syrian Lira salaries, a uniform, a car, and a gun after training them how to use it. Such privileges gave the naïve adolescents authority. They also put the boys they had recruited through a 1-month course in order to educate them about jihad for the cause of Allah. They would tell them that if you got killed fighting jihad you would go to heavens where there would be virgins waiting for you. The boys would get brainwashed, and then even their parents can’t stop them from believing in what ISIS had told them. Interviewer: But where does ISIS get their money from? Um Saleh: Definitely, the wealth of ISIS is the outcome of the oil wells they captured immediately after seizing control of the city. They dealt in USD which they weigh in scales rather than count. ISIS transferred money to Iraq in exchange for weapons. However, when a crisis took place in Der Al Zor and militias got divided, people tended to follow whoever they believed to be stronger. For example: if I belonged to Jabhat Al Nosra, whilst ISIS was becoming dominant, then I’d leave Al Nosra and join ISIS. Likewise, if the Kurds were dominant, I’d leave ISIS to join the Kurds, all according to who pays more. If you are a military officer general, brigadier general, or major and fled ISIS to the regime-dominated territory, ISIS won’t rob the house, but will use it. Living under ISIS you must stick by the laws; smoking is prohibited, and women must wear the niqab. I myself wore one, my daughter too, every woman had to wear a black niqab. High heels were prohibited, but we could use sneakers instead. There was no free will, you had to obey their laws. Violating the law meant that you would be punished. You might be arrested, jailed or lashed. And then put on a Shari’a, Islamic law course. Whoever was caught stealing was punished by having their hand cut off, if it was proved by 2 witnesses under oath, or if you were caught in the act. As for someone who is charged with dealing with the regime or any other party, the sentence was decapitation. Most of the beheaded bodies were not buried but rather thrown in a deep tunnel they had dug which I saw with my own eyes. Interviewer: How did you manage to escape? Um Saleh: It was so risky, as it is impossible that ISIS would let you go. If they caught you trying to flee, they would ask ‘’you want to go to the land of the hypocrites and disbelievers?’’. If that was the case, you would be sentenced to death, you and all your family. The night we left, it was a dreadful night. We left under air raid strikes in the middle of the night. We fled through the orchids and trees in the outskirts of town. To reach the Kurdish border, we had to walk through a minefield as Isis planted mines throughout the countryside to separate themselves form the Kurds. So if you want to escape ISIS, you need a guide who knows how to safely walk routes on the minefields. Otherwise, a mine might explode killing or wounding you. These guides exchange their services for money. We walked for three days, only moving at night in total darkness. All lights were forbidden. And we formed a single line carefully following in the footsteps of our guide who kept telling us if we stepped a wrong foot and ended on a mine that would blow all of us up. Walking and resting, it took us 3 days in the desert to reach the Kurdish checkpoints. The kids and women were all crying. We were so tired and scared. Um Saleh: When we finally reached the Kurdish border, they asked us where we came from. When we said Deir Ezzor, they told us to turn around and go back where we came from. We told them: “we are civilians. We are not ISIS!” We were about 4 or 5 families, but they made all of us go back. After the revolution, they sold everything, gangs came to rob and ruin our houses. This was terrorism, not a revolution. Imagine 20,000 fighters came to us, beheading, slaughtering, killing until blood filled the streets. Some of the bodies were eaten by dogs! What kind of revolution is that?! All the different brigades were fighting; fighters from Chechnya, Kazakhstan…even the Iranians and the Shia. All of them fought in Syria. It wasn’t only one side. It wasn’t regime vs. people. It wasn’t the people trying to topple the regime, but rather numerous combatants fighting. Killing civilians. Do you believe it was only the regime’s air raid strikes! There were also the Russian jets that slaughtered the civilians. Russia, Iran, and the regime strike targeting only the civilians among whom ISIS chose to stay, but where should the civilians escape to? The whole country was at war. We seek safety and security, not a new presidency. Only once we regain safety to return and rebuild our houses may the Syrian people return - whether the president is Assad or not. Bashar or not! This is not the people’s concern; the main concern is security and having a means of living - what more can a human being seek? This Was Radio Hakaya. Thank you for listening.